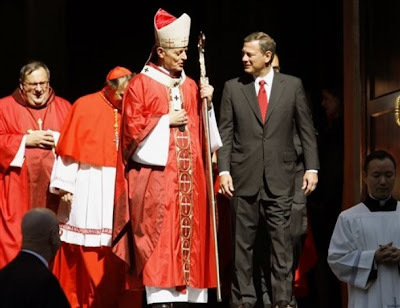 Fronting the pews at this morning's Red Mass in DC's St Matthew's Cathedral: the nation's First Catholic -- Vice-President Joe Biden -- joined by six Supreme Court Justices, including the bench's Chief John Roberts and newest member Sonia Sotomayor, both likewise of the fold. The specialized, formal knowledge of the law "frequently becomes semi-mechanical, even distancing," [Cardinal Daniel] DiNardo [of Galveston-Houston] told the congregation. "The law and lawyers are around because justice among human beings will always be an issue." "Even sophisticated, knowledgeable human lawyers need reminding, need a divine fire ... both in their personal lives and in their profession itself." Now in its 56th year, the annual liturgy to seek God's guidance for politicians, lawyers and judges was protested by anti-abortion activists deeming the event a "mockery" given the presence of politicos who, according to the group's leaders, "commit sacrilege by receiving the Body and Blood of Christ while they hold a knife to the throat of the unborn." Concelebrating alongside the capital's Archbishop Donald Wuerl were archbishop of the Military Services Tim Broglio, Bishop Paul Loverde of Arlington and the District's three auxiliaries. As is customary (but not required) in the case of a non-cardinal celebrant, DiNardo presided in the scarlet choir dress of a prince of the church, donning a stole to receive the Eucharist but not (as he also should've) for his turn in the St Matthew's pulpit. As ever, more to come as it comes in. DiNardo did not elaborate on the rights of the unborn, focusing instead on how the complexity of the law can have a dehumanizing effect on those who practice it.